Embryonic thymus. 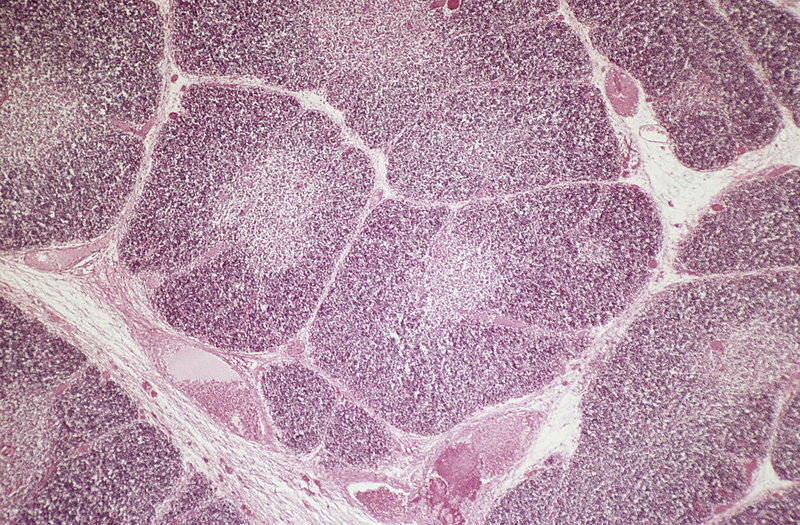 Light micrograph of a section through the immature thymus of an embryo. The thymus is an organ that hosts maturing immune system cells called T cells (T lymphocytes). It is most active in children up to puberty, after which it deteriorates throughout adulthood. The white branches here are fibrous septa that contain blood vessels. The thymus sections are composed of two parts: the darker stained cortex and the paler medulla inside it. The solid dark pink circles are Hassall's corpuscles, bundles of cells that produce chemical signals for creating specialised T cells called Regulatory T cells. Haematoxylin- chromatrope stain. Magnification: x30 when printed 10cm wide.